A new vision for the village of Werrington will be developed for the first time as a joint venture between the Parish Council, under the new Chairmanship of Councillor Kenn Griffiths, and the Werrington Community Volunteers Group who devised the initial proposal and who have recently received the acclamation of the prestigious Queens Award. The new initiative will be the launch of a Neighbourhood Plan which will harvest the views of all residents who will be able have their say in how they feel that the area should develop into the future, embracing health, education, wellbeing, leisure and housing, with a view to making Werrington a “peoples” village and cultivating a new era for the future based around an intergenerational format. The project, which will be carried out over a two year period, will be partnered by Hannah Barter who is a Director of Urban Vision Enterprise CIC, a non-profitmaking community interest company, based in Leek, who deliver community projects. There are grants available to provide financial and technical support in the preparation of the Neighbourhood Plan. Councillor Griffiths said that he was delighted with the new approach and commented – “In my tenure as Chairman I intend to make the Parish Council more accountable to residents and to ensure that the projects we undertake are properly researched to ensure that we get the best value for money and that we provide services that the majority of residents actually want. The first stage in this will be our joint venture with the Werrington Community Volunteers Group who are on our doorstep and are one of the most successful groups of its kind in the whole UK. This will bring new expertise to the council which can only help but take it forward in everyone’s best interests”. 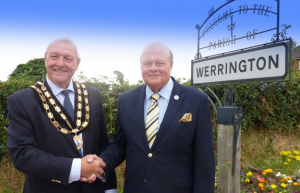 Councillor Kenn Griffiths Chair of Werrington Parish Council (left) with David Shaw Chair of Werrington Community Volunteers Group launching the new joint initiative Neighbourhood Plan.